Samsung BD-E8500 review | What Hi-Fi? 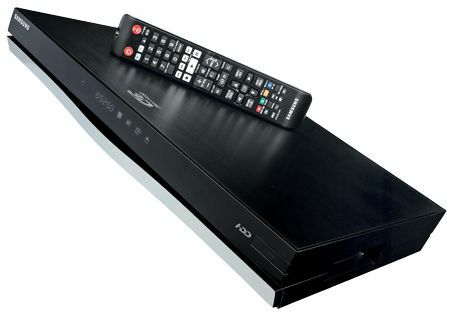 Samsung’s got a few tricks up its sleeve with the new BD-E8500 Blu-ray player. Once you notice twin RF sockets on the back panel and the inclusion of a 500GB hard drive, you’ll know it’s not just a simple disc-spinner. Those dual tuners make it possible for you to record two different programmes at the same time – you can even watch a third channel, as long it’s on the same frequency as one of the channels you’re recording. This is a pretty useful feature that helps the BD-E8500 stand out against its rivals. A glance at the manual will get you up to speed on how all the functions work, and it’s easy to use on a daily basis after that. The Freeview channel guide is decently laid out, but is somewhat less intuitive than the equivalent offering on the LG HR925M – but Samsung’s Smart Hub menus and interface have always been nicely designed, and are easy to use. You can also keep viewing a channel while web-browsing or switching to Samsung’s online portal (where you’ll find a host of multimedia options). Along with lots of family-orientated apps, online video content is available through Netflix and YouTube – our last day with our review sample coincided with the E8500 finally getting updated to include BBC iPlayer. Other media such as photos, videos and music stored on USB sticks or on your computer can be viewed in the AllShare Play hub, where all your recorded programmes will be accessible as well. While it supports playback of most media formats, the BD-E8500 doesn’t like WAV files. This is a good-looking player, not least because the front panel is styled with an elegantly curved metal finish, and the touch-sensitive buttons are integrated into the display screen –a rather nifty feature. As with the LG, Samsung has offered the combination of a traditional remote and a smartphone app, both of which are fairly easy to use. We start with Fargo on Blu-ray. The picture is relatively clear, and the cold and stark colour balance that reflects the film’s winter backdrop is handled nicely. The Samsung is speedy and confident, and while it lacks the subtle finesse of the Panasonic DMP-BDT500 or Sony BDP-S790 players, the film remains enjoyable to watch. Play Tintin in 3D, and you’ll find that motion is a Samsung strength – some minor blurring means it’s not perfect, but that element of the picture is comparable with, if not better than, than the LG’s effort. The BD-E8500 will upscale DVDs to 1080p as well – play Death at a Funeral and while there is a tiny amount of noise, it’s largely unobtrusive and doesn’t detract from enjoying the film. The Samsung suffers in a similar way to the LG player with sound. It is rather thin and unrefined compared with the more robust Panasonic players. It has fine dynamics, goes loud effortlessly and has a good soundfield, but it could do with an extra layer of subtlety and finesse. Samsung has always come up trumps in terms of features – something that’s becoming increasingly important these days, as we now expect equipment to come with all the trappings it can offer. Once again, Samsung gets it right in this respect, especially with that dual-tuner recording ability. And while that feature sets the BD-E8500 apart from its rivals, Samsung still needs to up its game in picture and sound quality, because the standards elsewhere are so high.